A number of people have started court proceedings for Judicial Review of the National Policy Statement for airport expansion in the South East. The NPS has not taken into account, it is claimed, any of the representations made. Therefore, we see no comment on the LAeq noise metric averaging out noise events. We see no comment on the Lowest Observed Adverse Levels of noise recommended in the advice given to DEFRA. We see no comment on the failure of the UK Government to observe the guidelines on noise exposure set out by the World Health Organisation. We see no comment on proposals for noise reduction. We see no details of flight paths to ascertain who will receive what amounts of noise. We see no comment on or resolution of whether flight paths should be spread out, sharing the noise amongst more people but reducing the number of people substantially affected by noise, or whether flight paths should be concentrated, increasing the number of people substantially affected by noise but reducing overall the total number of people suffering any noise (indeed the numbers of people affected are calculated on a “minimise total” scenario, which would cause an increase in the number of people substantially affected even if it keeps the total number of people affected down). We see no substantive plans for air quality, particularly in view of the past breaches of court orders and the acknowledged worsening of air quality due to the proposed development, or comments or proposals for observing targets for greenhouse gas emissions notwithstanding the representations made by both the public and the Committee on Climate Change. We see no comment on how regional expansion of aviation will occur in conjunction with the NPS scheme, while keeping greenhouse gas emissions within legally binding greenhouse gas emission targets. No due regard has been taken as required – particularly considering the size of the project and its effects upon people on the ground. It is claimed that the decision to develop Heathrow by allowing a third runway as recommended by the Airports’ Commission is biased. The Government have confirmed through their lawyers that Sir Howard Davies at the time of his appointment as chairman of the Airports Commission worked for one of Heathrow’s biggest shareholders before resigning on his appointment as chairman. This was not put into the register of conflicts of interest and it was entirely fortuitous that the association or former association was discovered. This is not to say that there was dishonesty. The Government has previously denied dishonesty. It is claimed however, that there is a legal presumption of bias, which should be rebutted by the Secretary of State. The so called night time flight ban does not comply with what the Transport Committee recommended since it is proposed to be only a 6.5 hour nightly ban on scheduled flights. With overruns, this period could be reduced to just 5 hours or less. The Transport Committee recommended an average of 7 hours respite per night – that is an absolute break from flights for an average of 7 hours per night. The claim questions whether Heathrow can afford the costs of expansion since it may not have the money to pay for expansion without state support – something that the Government has said on a number of occasions that it is not intending to give. The Group Accounts for FGP Topco and the Heathrow companies for the year ending December 2017 show gross assets of £18,304 million with total liabilities of £17,382 million making a net asset holding of just £922 million. The Heathrow group of companies may find it difficult to find £17.6 billion to fund this project when its biggest customer BA has publicly said that it will not pay any greater landing fees. It also represents a liability to assets ratio of some 90% which is far too high to be safe to fund a major infrastructure project such as building a third runway at Heathrow. Taking the profit of £179m shown in the accounts before adjustments, there is a profit ratio to capital which is attractive but is precarious and would be difficult for a commercial investor to substantiate where the borrowing to asset ratio is currently 90%. If there were further borrowing or bonds issue of say £15bn (giving some allowance for Heathrow’s claimed costs reduction) the borrowing to asset ratio could be over 97% assuming that the value of the assets is the same as the amount borrowed ((£17.382bn + £15bn) ÷ (£18.304 + £15bn) = 0.97). It is claimed that some form of State guarantee would be required to guarantee the value of the asset base, so that should debt mount or asset value plummet, the State would step in. The taxpayer, it is claimed, is going to come in for a liability, contrary to representations made. The value of the assets held may not necessarily be their acquisition value, as for example there will be a commitment to pay 125% of the land value to property owners dispossessed. Heathrow Airport Limited could be technically insolvent and could produce a Carillion type situation with the Government having to bail out Heathrow upon its terms or risk having an uncompleted project. No mention of this is made in the NPS or any of the supporting documents other than the statement that the Secretary of State is satisfied that the project is viable. Considerable concern has been expressed that Heathrow will price itself out of favour, considering it is already the most expensive airport in the World in landing fees, charging in the region of £22 per passenger landing fees as against say Gatwick or other international airports charging in the order of £7 per passenger. Previous Post What has been going on in the Teddington Action Group? 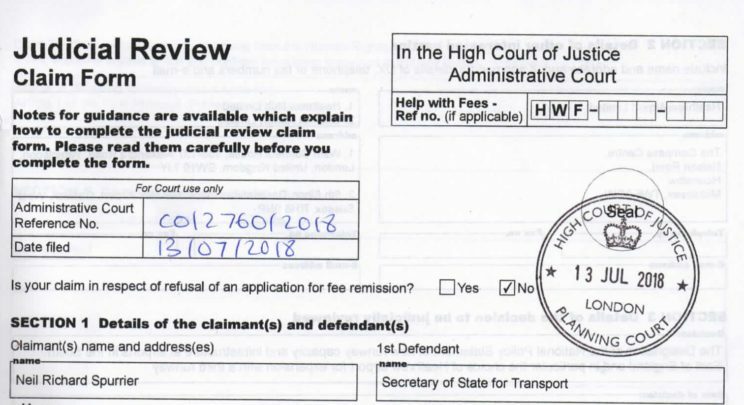 Next Post All remaining Claimants in Heathrow Expansion Court Case allowed to proceed. Thank goodness there are people out there prepared to argue this case. It is far too complicated for the general public to really understand or know how to argue the case. My fears are that the government cannot be relied upon to keep any promises and yet will promise anything to get it through. (they’ll all be out of office by the time the problems develop) and we’ll hear that well used phrase that it was the previous government who sanctioned this. I have no doubts about the foolishness of this project and that behind it all are shareholders and profits ,whatever the costs to the environment and climate and people’s daily lives. Plane Hell Action has posted this on its Facebook page and it has been tweeted.